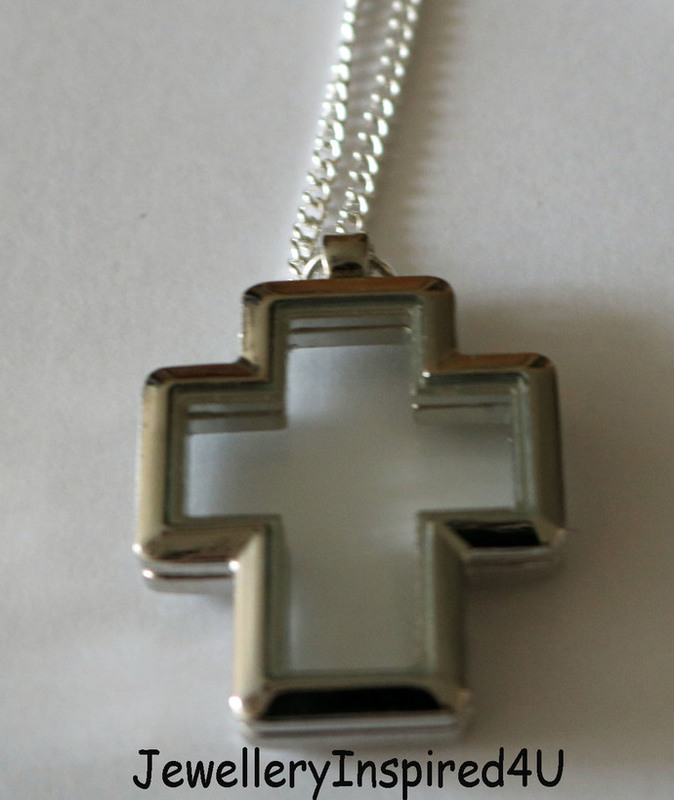 Glass Cross Floating Locket with Charms. Memory Locket. 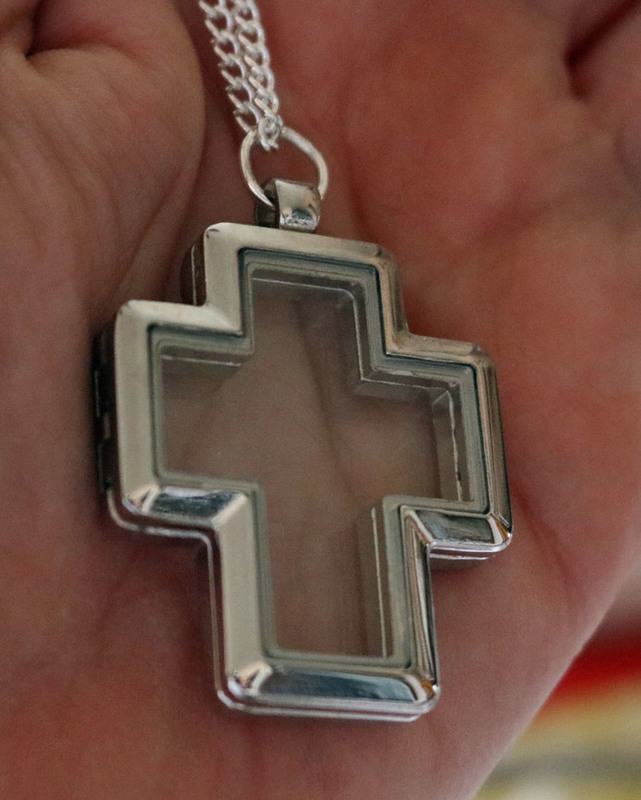 Religious Christian Modern Glass Floating Locket. Unique Devotional Locket. Jewelry Set. Glass Floating Locket. Display your tiny floating mini charms in a unique and personal way. Bring the light into your world, and let your faith shine! Unisex Gift. Also available is the mini round charm "Walk with God" with white background. Christian devotional religious jewelry. Devotional Jewelry. 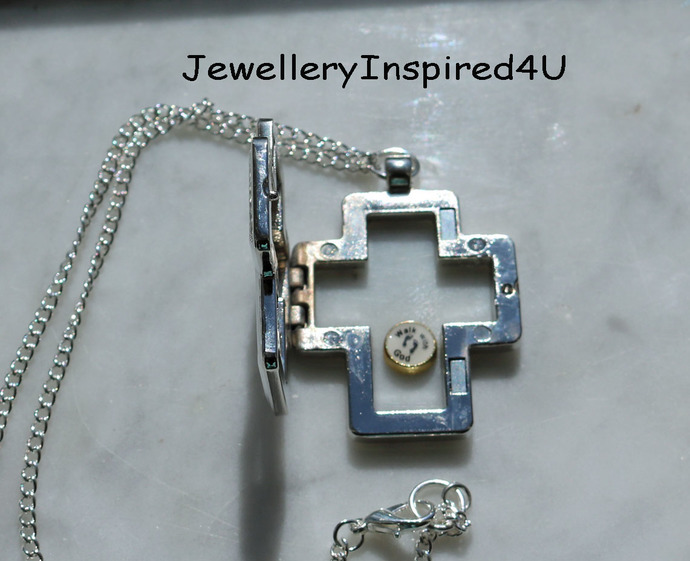 This listing is for one cross memory locket as shown. Display your faith proudly and fill it will little charms. What is beautiful is that the way this is constructed. The finished product is closed with a sterling silver jump ring, secured on a 16 inch chain. All my items are hypo-allergenic and nickle free. The locket opens with a hinge on the left hand side, and a notch to open on the right. Very easy and secures with a magnetic pin on the outer rim, securing your little charm inside. The top is finished with a round bail, to secure the jump ring. Special details: the locket will only open 45 degrees and should not be forced beyond that. Materials: Made from a high quality Zinc (looks like stainless steel) alloy which is lead and nickel free. Chain is sterling silver 16 inches in length. Measurements: Length 44mm x Width 33mm. (Length: 1.73 inches and Width: 1.29 inches). A satisfied customer said: "Thank you Vanessa for the memory locket. This glass floating heart cross locket is beautiful and better in person. The heart inside of the locket is the perfect size and can be used in the locket and also as a necklace without the cross. 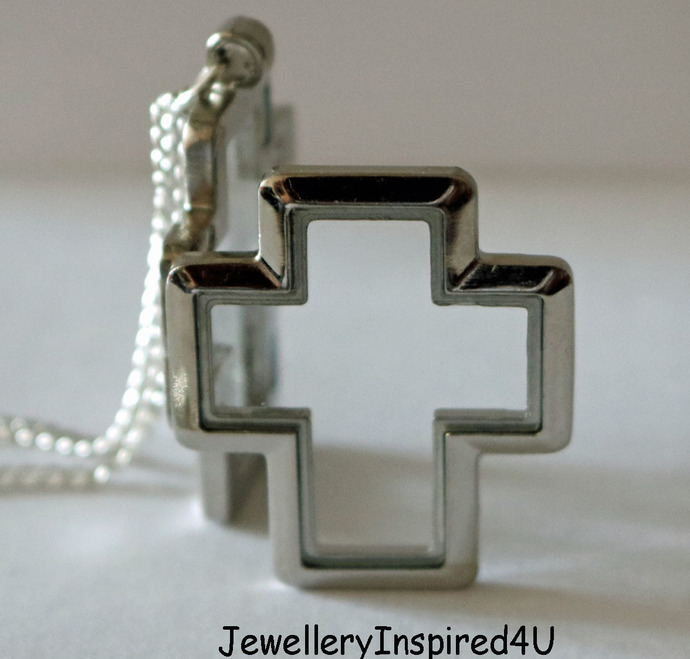 The jump ring on the cross is big enough to add other charms with the cross making this a multi faceted necklace. I love it." Please review my return policies and inspect your order upon receipt. Shipping: In Canada by regular post unless you wish express post option. U.S.A customers regular shipping via International Post, unless you wish tracked item to the USA. Please include a phone number where you can be reached for Canada Post requires that.